From Billa to Enthiren, why Rajni rocks for me. The first Tamil film I remember watching is Billa. I must have been around 7, and it was on Doordarshan Sunday evening slot. At that time, only my mama – who lived on the ground floor of our house – had a television, a black&white one. A whole bunch of us gathered there for the show. That’s when I got hooked to Rajnikant. AND this song was one of my first favourites, and comes into my head at the strangest of moments, even now. The rather ‘stylish’ Rajni shaking his bell-bottomed leg, surrounded by a bunch of women who shouldn’t even be caught dead in costumes like that. Over the years I have gone back and watched Rajni’s critically acclaimed films where he played the villain everyone loved to hate. I bristle when people call him a bad actor, because I’ve seen films where you get goose pimples just watching him ooze evil. Yes, then the superstar was born, and he became larger than life. He took on a different avatar… but he is effective. No one will accuse Rajni of being a good dancer or burden him with impeccable dialogue delivery. He will say way-sht for waste, shootheart for sweetheart, and don’t get me started on his Tamil. 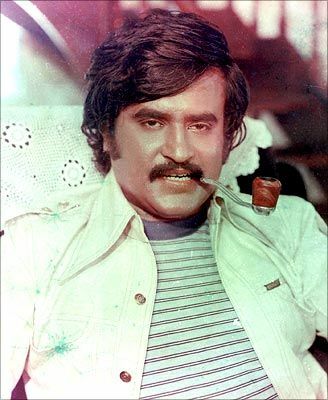 But that’s Rajni – the star who is huge on screen and contrasts it with an off-screen unmatched humility. Nearly 30 years later, watching Enthiren, I got the same kick as I did with Billa. Especially when Chitti turns evil, and particularly the ‘black sheep’ scene. Sitting next to me, watching the movie were a 9-year-old girl and a 7-year-old boy – the latter understands no Tamil, but that didn’t stop him from totally soaking in Rajni. That’s how fans are born. All around me were 30-, 40- and 50-year-olds who saw in Rajni what they saw in their preteens and teens. Give me this 61-year-old any day over the Ajiths and Vijays. I am always asked why a fairly intelligent person (me, me), who has even done a course in film appreciation, be so much ‘in like’ with Rajni. The short answer: I grew up with him. He, for me, epitomises entertainment. PS: The first Hindi film I watched in the theatre was Hero and English was Gandhi. You?